The nativity set I purchased for my grandchildren has a border collie in it- not a Roman drover dog, not a Canaan dog- a border collie! And the Scottish canine isn’t the only mistake. The smiling camel, which presumably carried the three tubby wise men, shouldn’t have showed up until much later; the angel on the roof is nowhere mentioned in scripture ; and- a PIG! Apparently, these Jews didn’t keep kosher. Whether or not the designer of the nativity set knows anything about Jewish culture, he certainly understands how to attract little people. My youngest granddaughter is completely mesmerized by our set. She will stand quietly arranging and rearranging its components so that, in her mind at least, they are just right. Last night, I discovered that the angel had flown away and the border collie was keeping watch from the top of the stable. One sheep had assumed a position up a palm tree, and the prohibited piggy sat grinning in the donkey’s cart. The holy family lay scattered around- apparently, Mary had decided that sheep are easier than babies, and was abiding in the field. 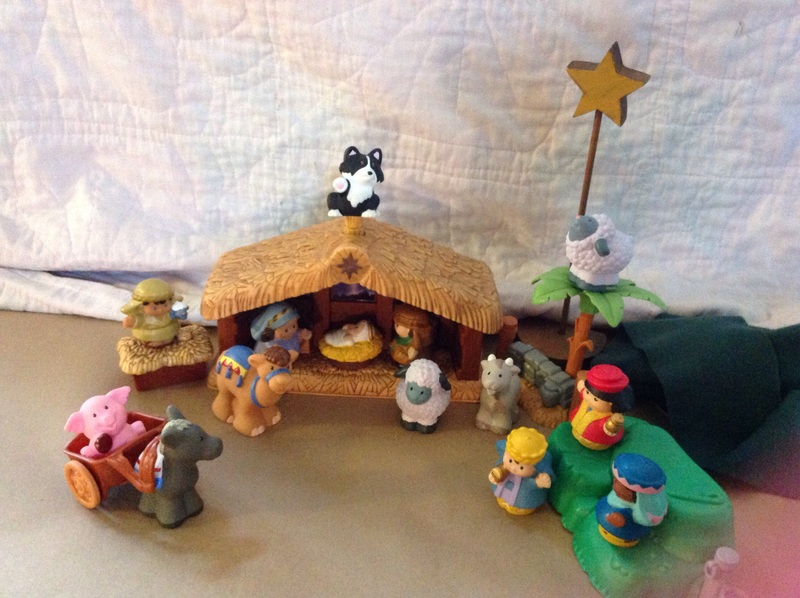 Periodically, my older grandchildren will wander by and put the set in order, but invariably, little Elinor will come back to fix it the way she wants it- with the angel gone and the border collie back up on the stable roof. What did the nativity really look like? Was Jesus born soon after His parents’ arrival in Bethlehem, or had they been there for a while? Did the birth occur in a stable or a cave, or was the couple simply assigned a room at the lower level of a house? Did Mary have help, or was Joseph forced to be midwife? Were animals there? The presence of a manger- a feed trough- implies it, but doesn’t prove it. A lot of talk has been devoted to the idea that Jesus was born in the filth of a stable, but there is no mention of manure or drool-soaked hay in the good doctor’s account. And I’d like to defend Mary here. What mother would wade through manure to plop her newborn into a bare feedbox? Wouldn’t she find a swept corner of the room, and insist that Joseph grab some fresh hay and a sheet for the manger crib? Jesus needn’t have been born in muck; it was hard enough that He was born amidst the squalor of the human condition. The children’s nativity set has smiling people wearing brightly colored clothing. It has a barn and a palm tree, a donkey and cart, a tiny mouse hiding in the hay. It all makes a happy scene, and serves an important purpose- to teach the child the elements of the Christmas story and establish the centrality of its serious message- that God came to earth as a baby to save us from our sins. The joy of that message should be reflected on every human face. If they could comprehend it, even the animals would rejoice. A happy border collie by the manger? Well, border collies herd lambs after all. Perhaps the nativity’s designer was wiser than I thought. When my mother was a little girl, she and her siblings were separated and sent from home to live in bad places. Her brothers were shipped to an orphanage almost 500 miles away, and Mom was left to grow up with her paternal grandmother, a mean-spirited, angry woman. Upon arrival at her new home, she was assigned a bedroom in the back of the house where she wouldn’t bother anyone. She lay scared that first night; it was dark and lonely, unfriendly to the abandoned eight year old. She told me that when she asked God to help her, she was filled with peace and the assurance that He was there, and would take care of her. Her life thereafter wasn’t easy, but she survived it and grew up to pass on the story. It made an impression: times might be hard, but God was good. Spending time with my paternal grandmother was a totally different experience. Instead of being exiled to a dark back bedroom, I shared a room with her. I still remember the feel of the pink, plaid, flannel sheets on the ivory twin bed. There was an off-white, wind-up clock on the dresser that lulled me to sleep with its loud ticking. I recall hearing trains as they passed through in the night, their mournful whistles advancing and fading. And even now, I can conjure up the comforting sound of Nannie’s rocker in the next room. It was easy to fall asleep there. Nothing was going to get me. There was clock- ticking, rocker- creaking, whistle- blowing peace. Through the Son men could regain favor with God, although the mechanism wouldn’t be revealed for another thirty plus years, when Jesus, “the propitiation,” died on a Roman cross. The skies were dark when Jesus died. No angels sang. On that day, it looked like hope for peace had expired with him. But then — He wasn’t dead any more! At the tomb, another angelic message was delivered: “. . . you are looking for Jesus, the Nazarene who has been crucified. He is risen; He is not here. . .” (Mark 16:6). Life is hard. It was hard for the shepherds; it was hard for the disciples; it’s hard for us. God did not send his Son to make life easy, but to make a way to eternal life. My mother and grandmother understood that. Their peace came from confidence in the one who gave himself up for them. The only one who can give us peace. Good news would have been the last thing they expected. When had they ever received any? Their profession had fallen into disrepute since King David’s day. Nobody wanted to grow up to be a shepherd. They weren’t invited to parties. They weren’t admitted as witnesses in court. They were nobodies, exiled from good society. Yet the angel was delivering a message— a momentous message, a joyful message— to them! And it was a communique‘ even they could understand. Their Savior had come, and was available for viewing at a local manger. After the army of singing spirits withdrew, the excited shepherds set off to find him. Scripture says that after they had seen the babe, they went back “glorifying and praising God for all that they had heard and seen, just as had been told them“. I think it is reasonable to see this as “rejoicing.” But what had changed to make them joyful? They were still uncomfortable, underpaid, and undervalued, and would most likely finish their lives in this unhappy condition. How could news of a good change that might not occur for another thirty years bring about joy? Could it be that they realized their Creator still cared, and he cared about them? For a few minutes, these common, earth-bound men of dust had touched eternity, and it changed their lives forever. Ours, too. God be praised: joy is not restricted to those who meet angels in pastures, but is the birthright of all who believe. In the sixties, Patricia McGerr published a short story entitled “Johnny Lingo’s Eight Cow Wife.” Yesterday, when it came to mind, I thought I’d have to spend days digging in internet archives for it, but I was mistaken. You can still easily find this tale about the transforming power of love. In the story, a young man offers to pay eight cows for the plain, dejected, Polynesian girl he loves. Her father is elated— he thought he’d be lucky to get one cow for her. The neighbors think the suitor is a sucker. The girl. . .well, that’s telling. We all do crazy things for love. Yesterday, I sat hunched in front of a computer screen for hours looking for Greek and Roman toy soldiers. The reason? I wanted to give a grandson something special for Christmas. We all strive to give those we love satisfying and suitable gifts. Time and money are of little matter—extravagance is in the nature of the lover. We light the second Advent candle in memory of God’s unequaled extravagance. He clothed the second person of the trinity in baby flesh and gave him to humanity. It was a satisfying gift because it met the need; a suitable gift because we could identify with it, and an extravagant gift because it cost God everything. Was this Bethlehem baby a crazy gift? In no way. For to those who receive him, he gives eternal life. Most of the time, we take this gift for granted. We forget our former situation and the colossal chasm of sin that separated us from our creator. We’ve become so used to the story that we lose sight of its consequences— that the chasm between us is closed, and the way is clear. We miss the glorious significance of it — those of us who believe are sons and daughters who have a hope and a future. McGerr’s story is fiction, but it reveals the truth about love. Love does what nothing else can; it rescues and then beautifies. That is what God did; what he is doing; and what he will do.